It is most definitely week 2 and I have definitely made some progress. To play catch up, I am in the process of transforming our den as part of the One Room Challenge. The before photo you see above probably makes you think the room doesn't need to be done, but I promise you its all smoke and mirrors. That 1982 brown den is about to re-emerge as a fierce girl perfect for 2016. Once that baby is lacquered in a bright and shiny white you will definitely see a major difference and I will probably question what took me so long to finally make it happen. Can you tell I am excited!! So this week I need to make a keep/toss list for you and let you know all I have accomplished. It was a big week for decisions and scheduling. 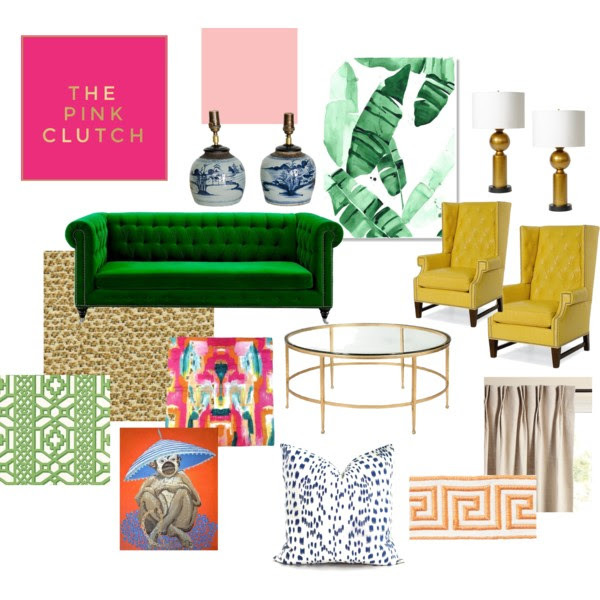 The painting starts this weekend so I needed to get organized and make a lot of fabric choices and furniture decisions. It was to do lists and lots of choices and plenty of decisions. Bam, bam and #bam. That gives you an idea of how all the pieces in the room were moved, used, stored or corralled to be sold. It was a lot more than I knew how to deal with. All of the accessories are boxed and I will sort thru them when I style during week 5 ish. Probably like the night before the reveal if you must know the absolute truth. 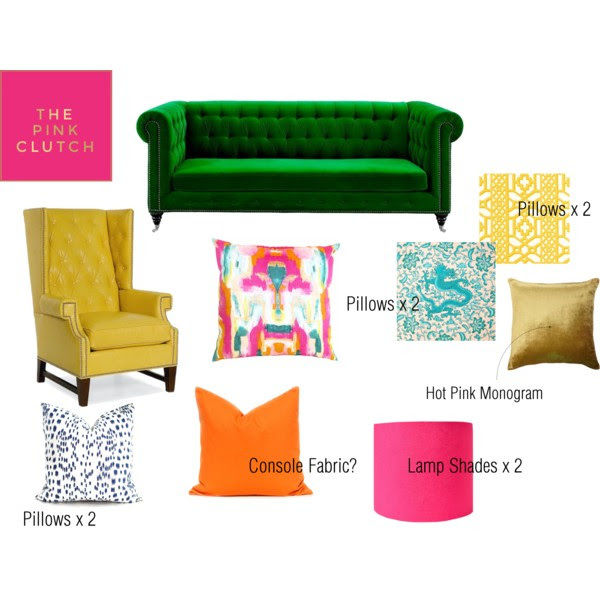 Once I found the green velvet for the sofa and decided on the side chairs the rest was a piece of cake. I hinted around last week that I am planning to use two Tailored for TBH chairs but you will just have to wait to see which ones and what they will look like. I can not wait to get them in my hot little hands. The rest of the fabrics are here. I know, I know ... you are probably sweating and thinking I have basically lost my mind and thrown a bunch of swatches together and called it a plan. Not true at all. When you see each piece come together it will be ah-mazing. And don't forget, I love mixing patterns. There are actually more solids here than I am comfortable with, but I also don't do white rooms. Basically I am way outside my box. Trims still to be determined, but the rest of the room is set. Of course, something will change but that is the name of the game. I can't wait to get the furniture in the room and start playing!!! I am also obsessed with this fabric I found yesterday. I am trying my darnedest to find a spot for it. I just love every single thing about it ... maybe a small pillow. Maybe drapes for the office next to it that you see from the den. I can't decide. I just know I need this baby and stat!! I am joined by an incredible group of designers this round ... I am pinching myself that I am part of this amazing line up. Make sure you follow along with their journey, that is by far my favorite part. Each week it is like Christmas watching each room transform. You can also follow along with our journey on Instagram using the hashtag #oneroomchallenge. And, make sure you are following House Beautiful magazine on Instagram and Pinterest. They will be showcasing bits and pieces along the way along with live pinning! This will be an incredible round, and I will be sharing tons of sneaks and pictures during the weeks as the room comes together. The good, the bad and, yes, the ugly. Yep, it will all be there for you to see. You can read about week 1 on the House Beautiful home page here. I am still so excited reading their thoughts from our first week. It's so good!!! And check the 249 incredible rooms in the Linking Participants. Holy fabulousness!!! Off to get things taped off for paint ... major changes for next week. Take one last look at the before pic. The brown is about to be ... see ya!!! 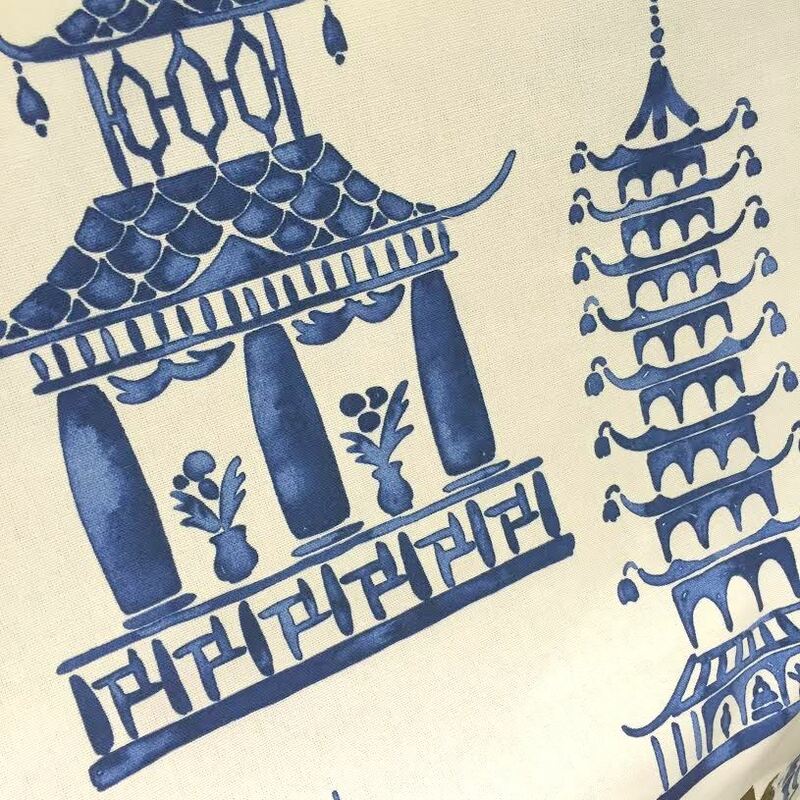 Looove the fabrics and we must have been running around in the same places last week because the blue and white pagoda fabric is on my camera roll and in tomorrow's post along with another blue and white chinoiserie fabric. I have been out of town but got off the plane and drove straight to Huff and started sourcing fabrics. We were like ships passing between the bolts of fabric!!! This room will be amazing. I love the colors and patterns and of course, the white walls!!! If you start to panic when they start rolling on all that white call me and I'll bring wine!!!! Loving every bit of your plan! This is going to be a really fun one to watch because honestly, I really love the "before" but I can see from the plan that the after is going to be fabulous as well. I can't wait to see how you make this already fantastic (at least to my eye) room even better. Simply LOVE the mix of patterns and the colors you've chosen. The room does already look "done" but I can see where your taking the transformation and it's going to be amazing! Have a great week! The before is gorgeous but I totally get it and I have a feeling we’re going to be totally blown away by the makeover!!! I think the paint will make a HUGE difference. We had the same paneling in our last house. I always wanted to paint it, but we downsized before the paint happened. You are inspiring a lot of us to get our color on. I can't even tell you how happy this makes me. I smile every time I see your color scheme. Love all the fabrics. This is going to be sooooo good, Paige!!! 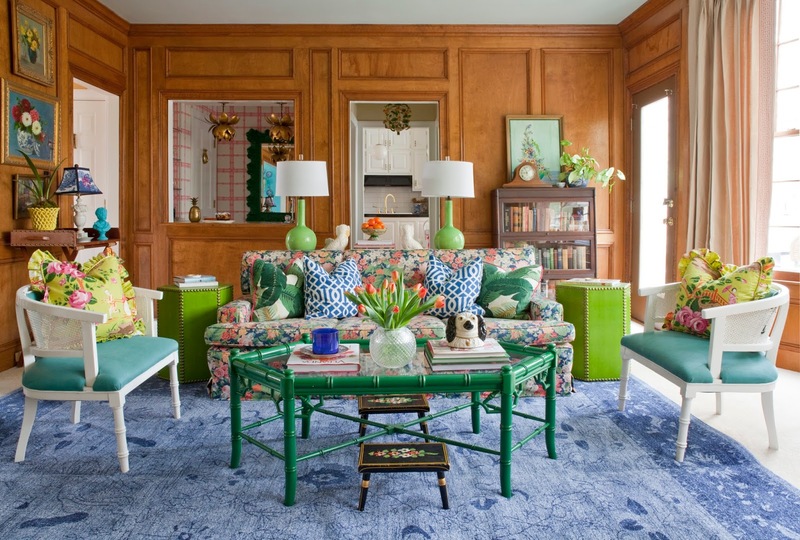 I loved this room so much before, and I know I will be blown away by the fabulous transformation! 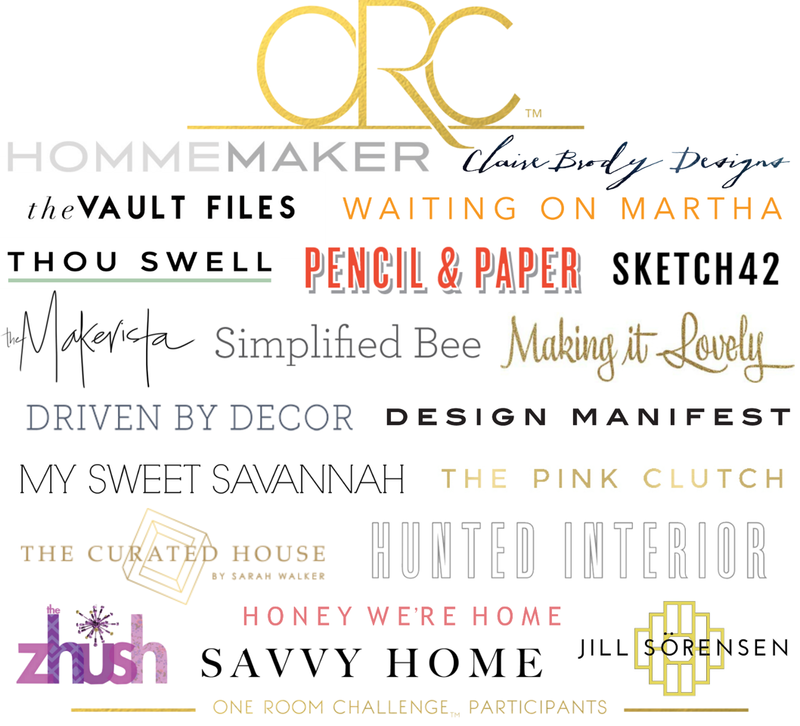 It's so fun to move furniture and decor around the house – I got so excited seeing your list of what's staying and going in the room! I just can't wait to see that white lacquer!! What a fun space cant wait to see it competed! Omy this is so exciting!! I can not WAIT to see this room, love the fabric choices already. Its going to be so bright and fun! It really is true that each week is like Christmas. Paige, this is amazing and so exciting. Love all of the fabrics and trims! 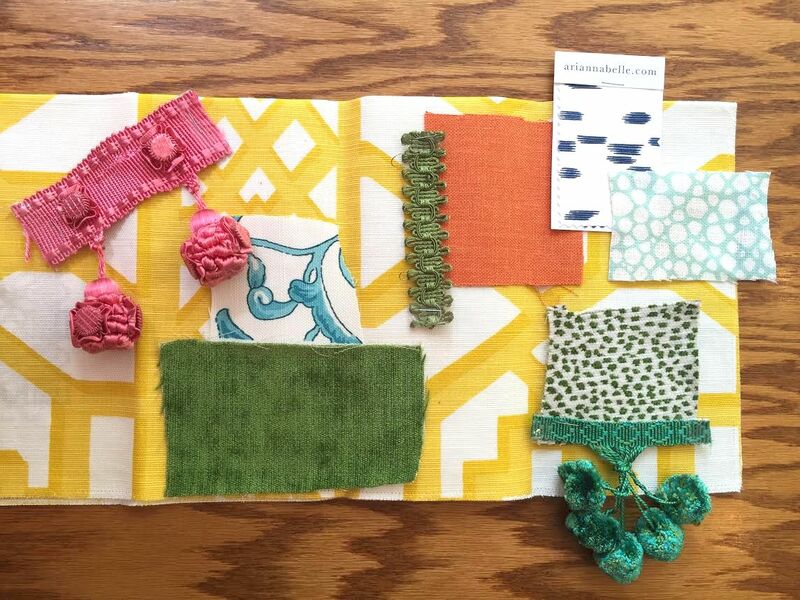 AHHH loving your mood board and fabrics!!! BEAUTIFUL!! I can't wait to see more!!! The room is going to be absolutely transformed with paint! 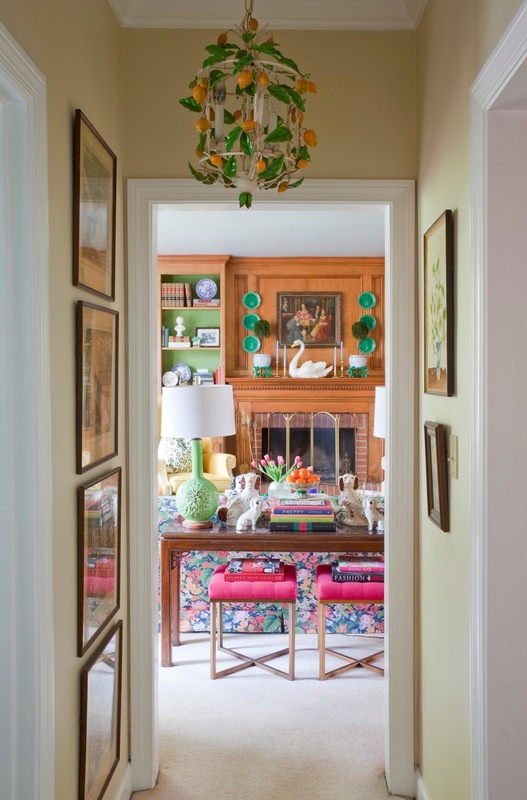 Love the mix of colors and patterns too! Thanks for sharing! Your fabric plan - amazing!!! I'm so excited to see you pull this room together!